Home / Drama / Essays. 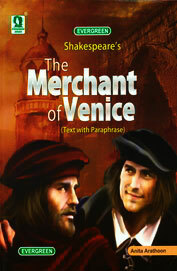 / Honours 3rd Year / Shakespeare / "The Merchant of Venice" is a comedy of incidents. "The Merchant of Venice" is a comedy of incidents. A study of the history of English comedy shows that two comedies have always existed. They are 'comedies of incidents’ and 'comedies of characters'. The distinction is based on the fact that in the former kind the interest of the play arises out of the complex of successive events or incident which are the results of various characters; and in the latter the main interest lies in the various characters of the play and the incidents are of importance only to illustrate the characters. scene where Tubal tortures' Shylock with news of Jessica, the crowning glory of the Trial Scene, the moonlight scene between the lovers Lorenzo and Jessica and lastly the comedy of the rings. and the 'plotting of the play is admirable”. characterisation. The incidents that form the plot reveal the characters. They provide occasions for the revelation of characters. in which they have been presented than in their successful depicting the intricate personalities of Shylock and Portia. The underplot of Lorenzo and Jessica is dramatically significant in so far as it urges Shylock on to revenge and create his mental collapse. The incident of the rings has its importance not as an incidence but because it gives an additional glimpse of Portia's brilliance and liveliness. Shylock and Portia are vividly portrayed with their varied aspects. It has a variety of characters-and they are individualised. complete play in which character takes precedence over plot.